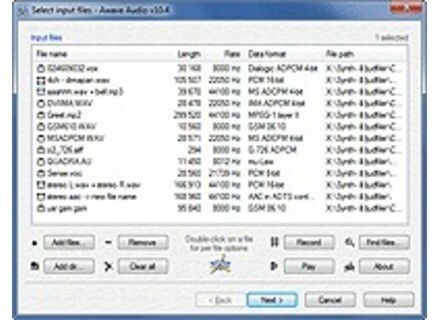 FMJ-Software Awave Studio 10, Sampler Format Converter/Browser from FMJ-Software. FMJ-Software has updated Awave Audio to v10.4. Added a "Play selected" option to the "Add files" dialog where, when you select a file, you can hear its contents playing after 1s. The dialog is now also resizeable. Added support for the Windows Audio Sessions API (WASAPI) for audio playback. 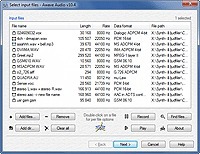 This is the "native" audio interface for Windows 7 and Vista, providing low-latency, high quality audio playback (when running on Windows XP, the DirectSound API is used instead). Added support for "performer" (band, orchestra) and "conductor" text meta data. Added support for reading audio data from Matroska container format files (.MKV and .MKA). Currently the following audio codecs are supported: MPEG, AAC, Ogg, and PCM (sorry, no AC3 or DTS.). Added support for reading audio from .AVI files that use OpenDML index list extensions (a.k.a. "AVI v2"). Added support for reading .WAV files containing Ogg Vorbis format compressed audio. Added support for reading rare "non-seekable" .OGG files. Added support for reading and writing raw 12- and 20-bit signed linear PCM audio data (.L12 and .L20 files), packed as per RFC 1890 and RFC 3190. Added support for reading 2/2.67/4-bit SoundBlaster/Creative Labs ADPCM compression from .VOC files. Added support for reading and writing DAT LP (long play mode) 12-bit non-linear audio format (.DAT12 files), as per IEC 61119, and packed according to RFC 3190. In total, including formats already supported in previous versions, the following file extensions borrowed from RTP payload encoding names (RFC 1890 and RFC 3190), are now recognized: .L8, .L12, .L16, .L20, .L24, .DAT12, .G721, .G728, .GSM, .MPA, .PCMA and .PCMU. Visit www.fmjsoft.com for more details. EastWest Updates PLAY 2 EastWest has updated its PLAY Software to v2.0.8. Producer Loops Drum & Bass Tip Trixxx Volume 1 'Drum & Bass Tip Trixxx Vol 1' takes this series into "new and dark territories," containing about 500 individual Drum and Bass loops and samples available in various formats.